We first covered Broadwell-DE in 2015 which you can read about in Intel SoC Changing the low end with Broadwell-DE. We also were the first to benchmark most of the SKUs in the Broadwell-DE range. 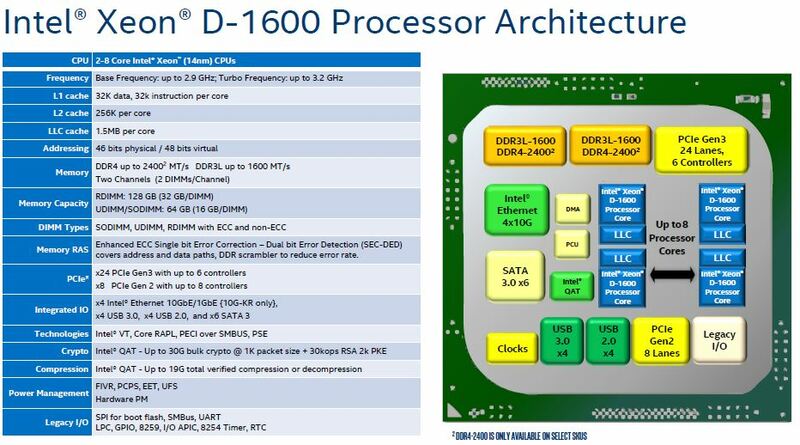 Now, four years after the line’s original release, Intel is releasing what it calls the Intel Xeon D-1600 series. In this article, we are going to discuss what that implies. Let us cut to it. The Intel Xeon D-1600 is the Intel Xeon D-1500 NS series with higher clock speeds. We asked whether this is the right way to frame the new SKUs and Intel said “yes.” Here is the setup: Hewitt Lake is a way for Intel’s customers to get higher clock speeds in a familiar package. The architecture is largely the same in this generation as the Intel Xeon D-1500 NS. The “NS” if one recalls saw the onboard 10GbE went from two to four ports. We have a history of the Xeon D-1500 to Xeon D-2100. With the Intel Xeon D-1600, Intel is using extra TDP headroom to increase clock speeds instead of increasing core counts. That means we have 2-8 cores but new base frequencies of up to 2.9GHz and turbo up to 3.2GHz. 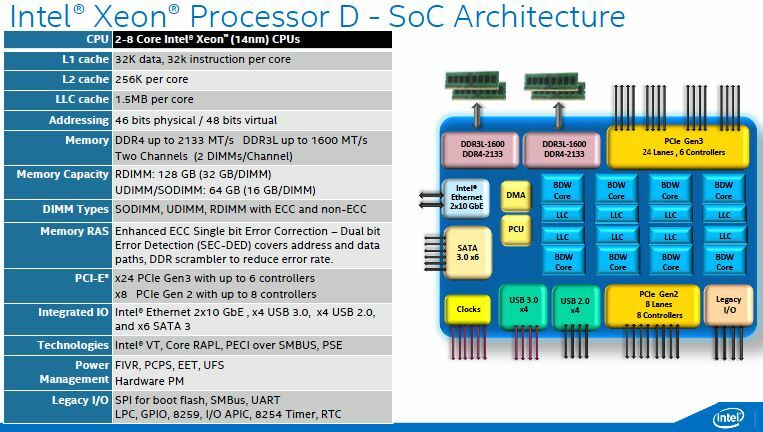 Since this is still Broadwell-DE at its heart, it is still a 14nm chip with 24x PCIe 3.0 lanes and 8x PCIe 2.0 lanes and six SATA III ports. DDR4-2400 support is still limited to DDR4-2400 speeds. What is really intriguing here is that if you look back to the original Broadwell-DE architecture from Q1 2015 you will see a very similar table, minus the QAT acceleration. 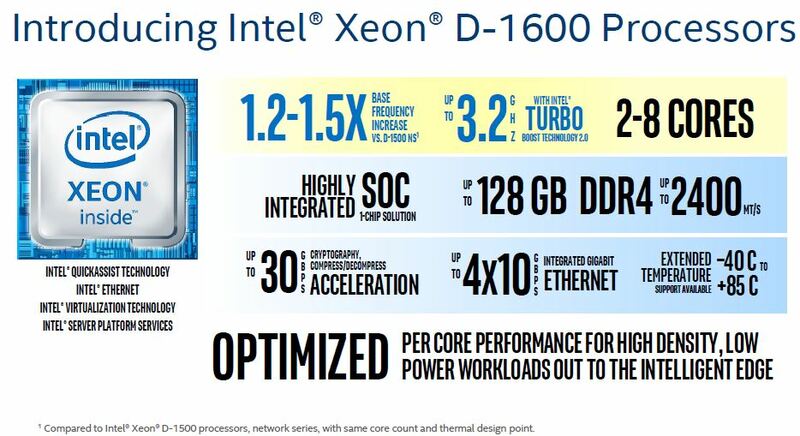 As you can see, the new Intel Xeon D-1600 range is designed for lower power in largely the same power envelope as the Atom C3000 series “Denverton” SoC. With higher-power cores, Intel offers two options in the lower power envelope now with the Xeon D-1600 and Atom C3000. Since the Intel Xeon D series is targeted at the communications space, these chips support Intel QAT offloads for crypto and compression. 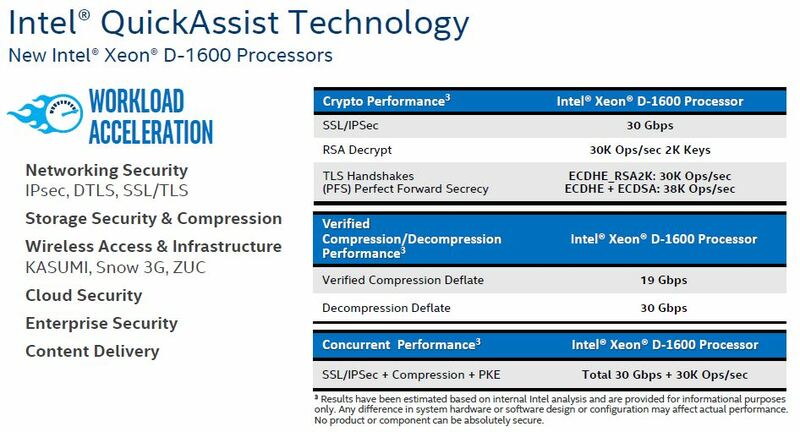 Here are the official performance numbers from Intel. 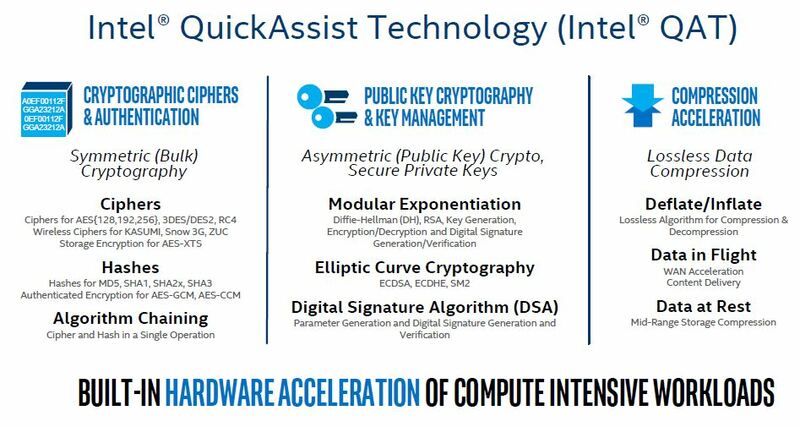 One item to note, and something we learned in our Intel QuickAssist Technology and OpenSSL Benchmarks and Setup Tips piece, not all Intel QAT versions are the same. First introduced with the Intel Atom C2000 series, like the Intel Atom C2758, that version is different than what is in Broadwell. 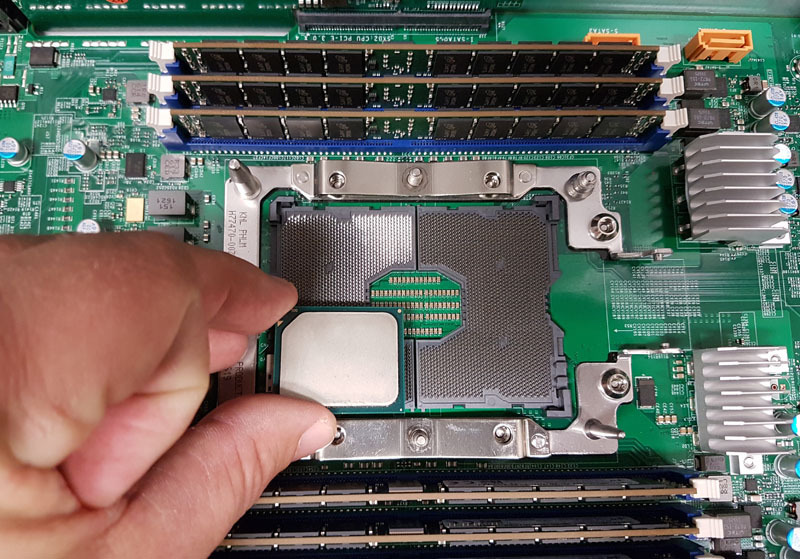 Also, the Xeon D generation is not the same as we find in the burgeoning Intel Xeon Scalable Lewisburg PCH options, nor the Intel Atom C3000 series. STH asked if this was still the older QAT at Intel’s event and the company confirmed. This is simply trading TDP for higher frequencies, not a major feature enhancement. 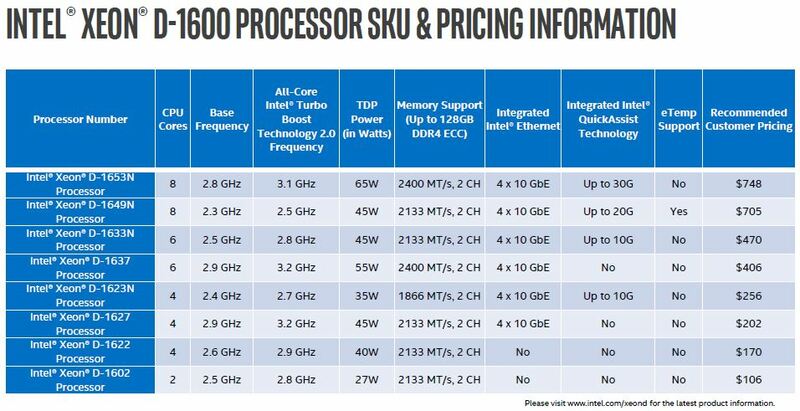 As you can see, despite these essentially being the fourth wave of SKUs based on the same underlying architecture, and without the high core count parts, Intel is still charging a hefty premium for the six and eight core parts. 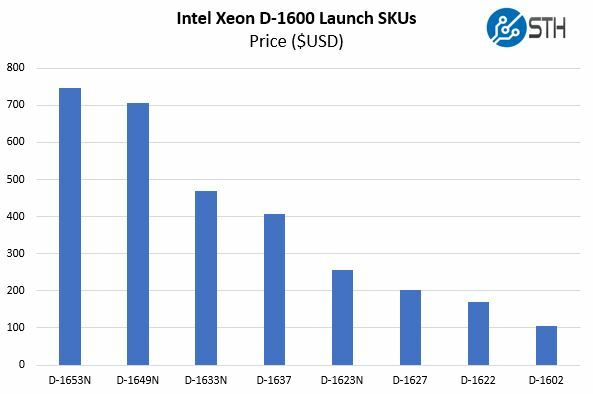 From a value standpoint, the Intel Xeon D-1649N costs the most for cores * base clocks while the quad-core Intel Xeon D-1627 and D-1622 are the leaders on the value side. Overall, these are solid chips. One quick item of note, the Intel Xeon D-1602 is now labeled a “Xeon”. In the original wave 3 Xeon D-1500 chips, the dual-core model was labeled a “Pentium” as in the Pentium D1508. The Pentium D1508 had dual 10GbE that Intel is removing in this generation. This is something we have wanted to see Intel do for some time. The Intel Xeon D-1500 series is an excellent chip. Many edge applications simply do not need more than 8 cores and the newer instruction set of Skylake (e.g. AVX-512.) 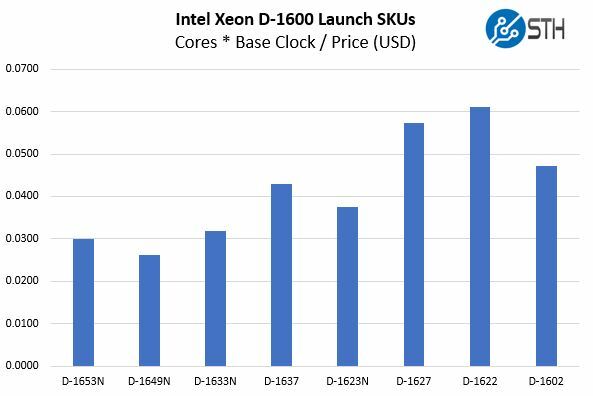 With Intel Xeon D-1500 series, clock speeds have always been lower, which means that one was forced to make a tradeoff. 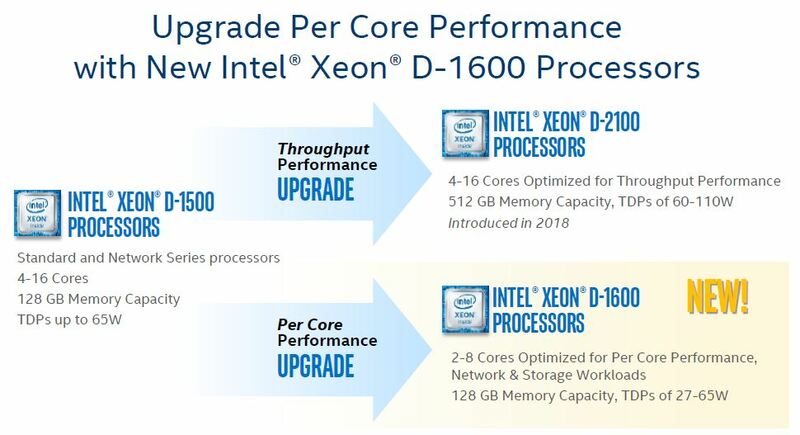 Higher TDP and the more advanced Xeon D-2100 series or lower clock speeds and the Xeon D-1500 series. With the Intel Xeon D-1600 series and higher clock speeds, Intel is going a long way to close that gap. A sadly pathetic refresh, it’s still the same 4+ old product. Will see how these compare to Epyc 3000, but I’m afraid choosing one over the other is just a matter of cost and board/platform design. Just checked the 1637 and on Ark and it’s listed as 6/12. @Safari – At least from SuperMicro, the Epyc 3xxx line of boards doesn’t get to take advantage of the integrated 10GbE capabilities. 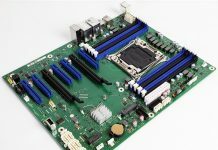 The SM Xeon D-2xxx boards, at least the FlexATX variety, had 10GbE built in, plus 2 PciE slots… offering plenty of options. I’ll be interested to see what the (FlexATX) Xeon D-16xx boards look like.